ATTENTION 5th graders :: You may need a DTAP dose before entering middle school (age 11). Ask your doctor about :: The MENB Shot TOO. Prevents group B bacterial meningitis that can kill and maim in hours. Must have a meningococcal vaccine before 7th grade. Report communicable diseases. For example: strep, chicken pox, flu and lice. All medications must have a Doctor's written order (see Forms & Policies) ... even over the counter medications like Tylenol (acetaminophen), Advil (ibuprofen) and allergy eye drops. Make sure your contact information is updated online (if your district has an online emergency contact form) and in the main office of the school and by paper, (if they do not have the online form or the power goes out). Make sure your child knows your phone number and the phone number of a few more people to call in an emergency. It is not enough to have the number stored in their phone; it might not be charged at that moment. Know that a school nurse cannot diagnose. They can make a suggestion of what they think might be going on, but you have to take your child to a doctor to receive a diagnosis and treatment. The school nurse also is not your primary care clinic. 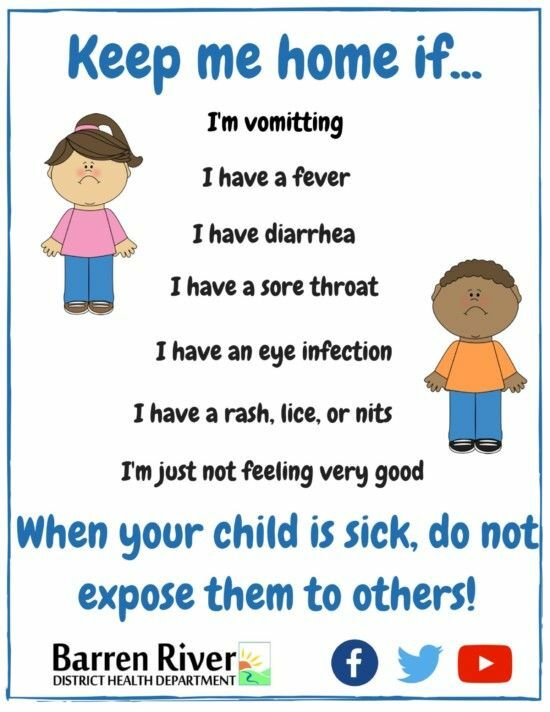 However, sometimes school nurses might notice things that a teacher or parent has not, and often, they know what illnesses are going around the school or community. Follow the 24-hour fever-free rule to return to school. Our nurses understand that parents have to work, but giving a child Tylenol (Acetaminophen) or Advil (Ibuprofen) to get the fever down, does not qualify as being 24-hours fever-free. It has to be 24-hours fever-free with no medication. This is for your child’s safety as well as other children’s safety to stop the spread of disease. For Pre K and kinder students, put a clean pair of pants and underwear in their backpack and keep an extra set available all year. Share medical information with the nurse. Nurses want to know if your child has a chronic illness and the medication your child is taking and how much, food or other allergies your child has and what to do if he/she has an allergic reaction, and any mental health diagnoses. It can be beneficial to sign a records sharing request from the child’s doctor’s office to send medical information to the school nurse.